Camplex SMPTE fiber optic cables deliver the clarity and high performance that broadcast professionals require. From breakout cables and adapters, power and signal extenders to camera cable jumpers and LEMO fiber connectors Camplex has everything you need. As a Neutrik Certified opticalCON Cable Assembler, Camplex builds high-grade cables in multiple configurations. Camplex MTP cables simplify connections and save space for AV or data transmission requiring multiple signal paths. High-quality Camplex general purpose cables address a variety of applications and meet rigorous industry standards. Broadcasters depend on rugged Camplex tactical cables to provide reliable performance in harsh environments. Ensure secure signal transmission interfaces over long distances with Camplex fiber converters & extenders. 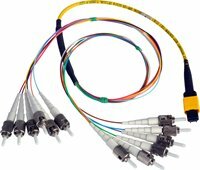 Complete your fiber optic systems with Camplex hardware and accessories for clear and reliable data transmission.